INDUSTRY.co.id - Pontianak - President of the Republic of Indonesia Joko Widodo inaugurated 16 oil fuel dealers one price at Pertamina Petroleum Terminal Pontianak, West Kalimantan Province, Friday (29/12/2017). President Joko Widodo in his speech stated that the government's efforts in realizing justice for people in 3T (behind, in the fore, and outermost) areas are marked by the presence of BBM channeling institutions at that price. Targeted people in the 3T area are targeted, and can feel the price of fuel assignment with other regions, the President also said. According to the President, this justice energy is a concrete manifestation of the 5th principle of Pancasila, namely Social Justice for All Indonesian People. BBM one price has also pushed the wheels of the economy, so that the future can develop like other areas. However, what should be noted is the supervision of various parties, both from the apparatus, local government, and stakeholders so that BBM one price can be enjoyed by the public at a price according to the government's determination, said President again. The 16 points of BBM dealerships are spread across several regions, namely four points in Papua and West Papua, then one point in North Maluku, five points in Kalimantan, one point in Sulawesi, one point in East Java, and four points in the Riau Islands. 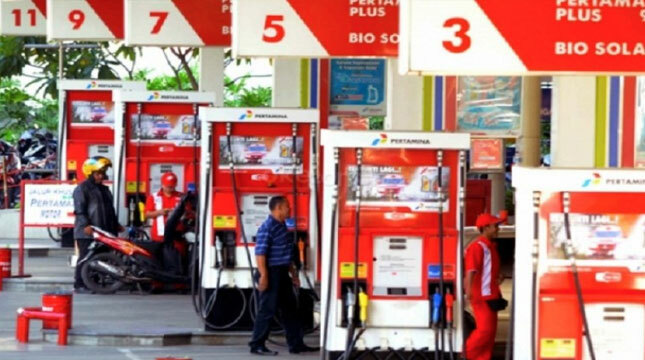 The inauguration marked the achievement of the target of establishing a fuel supplier agency at a price in 54 locations that Pertamina has realized this year. Elia Massa Manik, President Director of PT Pertamina stated that based on the roadmap compiled in early 2017, the company targets the development of 54 distribution points throughout Indonesia, and is realized by eight marketing operations areas of Pertamina. "Despite the many challenges and obstacles faced, especially the geographical conditions at the construction site of the fuel supplier institutions that are quite difficult to penetrate, Pertamina continues to try and believe the fuel target of one price will be completed within the stipulated time," he told Anara. In the last week of 2017, Pertamina with the support of all stakeholders can maximize various steps, so that the process of sending fuel to the destination before the end of the year. Based on the roadmap set by the government, the One Billion Price Fuel Program is realized with the establishment of channeling agencies in 3T areas targeted at 150 points, over three years ie from 2017 to 2019. Completed 54 points in 2017, then Pertamina will pursue the second target, which is 50 points in 2018 with the criteria of areas that have limited land and sea infrastructure, he said. "The BBM one price program is a noble task for Pertamina as a state-owned company, which is to realize equity and equity in the provision of energy for all Indonesian people," said Massa Manik.